Who is not familiar with the world of fairy tales? No one i guess..we all grow up with it one way or another. I am so giggly and excited doing this post, being a big lover of fairy princess. I watch Disney movies over and over again. As a child it's okay to mimic our favorite princess, wearing ball gowns but wearing them now will be ridiculous, i mean would you go to a cocktail party or go shopping wearing a ball gown? =) Is it possible to get fashion inspiration from Disney Princesses? It is indeed possible, if done the right way it would actually look good . to go a fancy ball where the Prince fell in love with her. Look 2 is inspired by Cinderella running in the garden (half torn-one shoulder pink gown) when her step sisters tore the pink gown her little animal friends made for her for the ball. I recreated the scene with a half shoulder pink dress. Look 1 is inspired by Princess Aurora roaming in the forest with her animal friends and picking berries. Look 2 is inspired by Aurora's Pink dress, form fitting top and and a-line cut skirt but i made mine in pencil cut. And the different shades of pink. Look 3 is inspired by Princess Aurora getting married and dancing with prince and since the 3 fairies are fighting over which color the dress will be, there is no exact color what the dress end up. 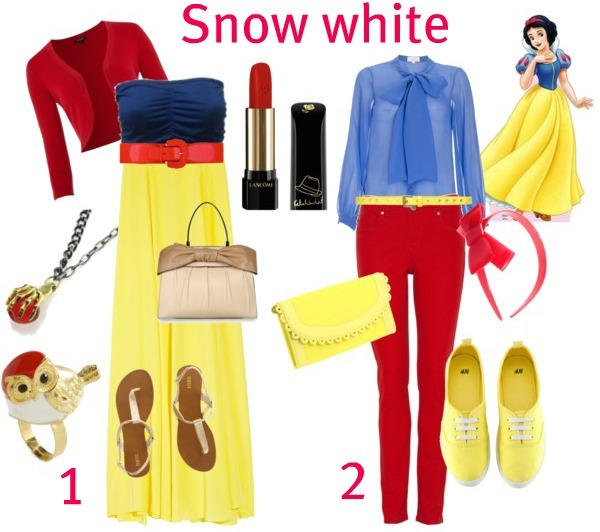 Snow white's always wear the primary color, red, blue and yellow. She is a big animal lover. So which Disney Princess fashion do you prefer? This post is really cute! Nice! Nicely done! My favorite is Snow White #1.